MELVILLE, NEW YORK, November 20, 2006 - FONAR Corporation (NASDAQ-FONR), The Inventor of MR Scanning™, announced today, that in a lavish dinner celebration in La Jolla, California, FONAR was presented the 2006 North American Medical Imaging Industry Innovation & Advancement of the Year Award from Frost and Sullivan. FONAR Vice Presidents David Terry and Lawrence Minkoff, Ph.D. received the award on behalf of FONAR. 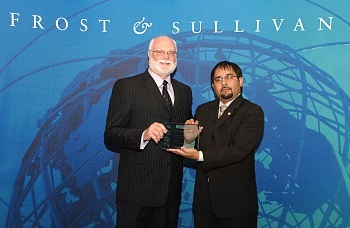 Visit www.fonar.com/news/pdf/frost&sullivan-award.pdf for a summary of the award. Mr. Antonio Garcia, Industry Manager For Patient Monitoring and Medical Imaging of Frost & Sullivan said, “Frost & Sullivan presents the 2006 North American Medical Imaging Industry Innovation andAdvancement of the Year Award to FONAR for their unwavering leadership as a pioneer in magnetic resonance imaging (MRI), ever since the company’s introduction of the first commercial MR scanner in 1980. Spurred during the 1970s by founder Dr. Raymond Damadian’s significant research discoveries in the area of nuclear magnetic resonance (NMR) for cancer detection, his origination of the idea of scanning the human body by NMR and his patent of the first MR scanner, FONAR went on to become the innovative force behind all three magnet types in use today, namely superconducting, permanent and resistive magnets. FONAR has also established itself as the only manufacturer that offers an Upright (Multi-Position) MR scanner that allows for the imaging of patients in seated, standing, flexion and extension positions, which permits dynamics visualization of the fully weight-loaded spine in contrast to the present day pictures of the non weight-loaded spine obtained in conventional static single-position recumbent-only MRI’s. “For nearly 30 years, FONAR has led the medical imaging industry in promoting the clinical utility of MR and the multitude of applications that can be performed with this technology. In recognition of the company’s longstanding role as a pioneering innovator of MR technology, Frost & Sullivan is proud to bestow upon FONAR the 2006 North American Medical Imaging Industry Innovation and Advancement of the Year Award,” exclaimed Mr. Garcia. Frost & Sullivan, a global growth consulting company, has been partnering with clients to support the development of innovative strategies for more than 40 years. The company's industry expertise integrates growth consulting, growth partnership services, and corporate management training to identify and develop opportunities. Frost & Sullivan serves an extensive clientele that includes Global 1000 companies, emerging companies, and the investment community by providing comprehensive industry coverage that reflects a unique global perspective and combines ongoing analysis of markets, technologies, econometrics, and demographics. For more information, visit www.awards.frost.com. FONAR® was incorporated in 1978, making it the first, oldest and most experienced MRI manufacturer in the industry. FONAR introduced the world's first commercial MRI in 1980, and went public in 1981. Since its inception, FONAR has installed hundreds of MRI scanners worldwide. Their stellar product line includes the FONAR Upright™ Multi-Position™ MRI (also known as the Upright™ MRI and the Stand-Up™ MRI), the only whole-body MRI that performs Multi-Position™ Imaging (mpMRI™) and scans patients in numerous weight-bearing positions, i.e. standing, sitting, in flexion and extension, as well as the conventional lie-down position. The FONAR Upright™ Multi-Position™ MRI often sees the patient's problem that other scanners cannot because they are single position, lie-down only. With nearly one half million patients scanned, the patient-friendly FONAR Upright™ Multi-Position™ MRI has a near zero claustrophobic rejection rate by patients. A radiologist said, “FONAR Upright™ MRI – No More Claustrophobia – The Tunnel Is Gone.” As another FONAR customer states, "If the patient is claustrophobic in this scanner, they'll be claustrophobic in my parking lot." Approximately 85% of patients are scanned sitting while they watch a 42" flat screen TV. FONAR’s latest MRI scanner is the FONAR 360, a room-size recumbent scanner that optimizes openness while facilitating physician access to the patient. FONAR is headquartered on Long Island, New York, and has approximately 400 employees. The Inventor of MR Scanning™, True Flow™ MRI, Stand-Up™ MRI, Upright™ MRI, Dynamic MRI, Position™ MRI, Multi-Position™ MRI, PMRI™ and The Proof is in the Picture™ are trademarks of FONAR® Corporation.